We’d love your help. 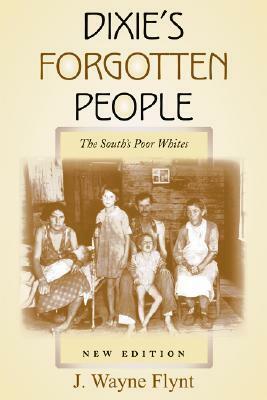 Let us know what’s wrong with this preview of Dixie's Forgotten People, New Edition by Wayne Flynt. To ask other readers questions about Dixie's Forgotten People, New Edition, please sign up. When Franklin Roosevelt referred to the forgotten man, he was likely thinking of those men in the city's breadlines. The South, however, was home to a host of forgotten men: poor whites, who lost in the land-grab and who industrialism largely left behind. Dixie is a quick survey into the realm of rural white poverty, succeeded wholly by Flynt's own Poor But Proud. Despite its brevity, it provides both flavor and substance. Myths about displaced Norman cavaliers fleeing England to restore the old When Franklin Roosevelt referred to the forgotten man, he was likely thinking of those men in the city's breadlines. The South, however, was home to a host of forgotten men: poor whites, who lost in the land-grab and who industrialism largely left behind. Dixie is a quick survey into the realm of rural white poverty, succeeded wholly by Flynt's own Poor But Proud. Despite its brevity, it provides both flavor and substance. Myths about displaced Norman cavaliers fleeing England to restore the old order in the South not withstanding, most poor whites came from the same stock as those men who became the masters -- at least those in the 'core south', where Flynt primarily draws from. They emerged as economic losers, families who either arrived late and got the leftovers or soil that had already been picked clean, or who were out-done by the rising gentry creating their vast fiefdoms. The Civil War left them with even more crushing poverty in the form of tenant farming, and the ruined south was hard to transform into the "new", industrialized south. A fierce contempt for accepting charity from outsiders frustrated well-meaning missionaries and social reformers, but they were not altogether left behind. Some tried to escape rural poverty by working in the mills, which were often more dangerous and no guarantor of comfort, and others lobbied for more political power. Some even overcame racism to create an race-blind tenant farmers union; from such a union came the later Civil Rights marching song, "We Shall Overcome". Racial cooperation in the realm of labor was one of the dashed hopes of the 19th century populist age, however. The world wars were kind to the South, bringing more industry and money, but the interwar years consisted of an economic slump so dismal that the Great Depression wasn't even noticed. While the South as a whole became more productive with the advent of machinery, added jobs initially constituted only a quarter of those lost to the machines. After World War 2, the Southern economy finally quickened, but many still remain left behind -- especially in Appalachia, which receives a section unto itself. In short, Dixie's Forgotten People was a quick and varied survey, albeit one supplanted by the weightier Poor But Proud. Gave me a better sense of how and why people's attitudes have developed in the state. James Wayne Flynt is Professor Emeritus in the Department of History at Auburn University. He has won numerous teaching awards and been a Distinguished University Professor for many years. His research focuses on Southern culture, Alabama politics, Southern religion, education reform, and poverty. He is Editor-in-Chief of the Online Encyclopedia of Alabama.